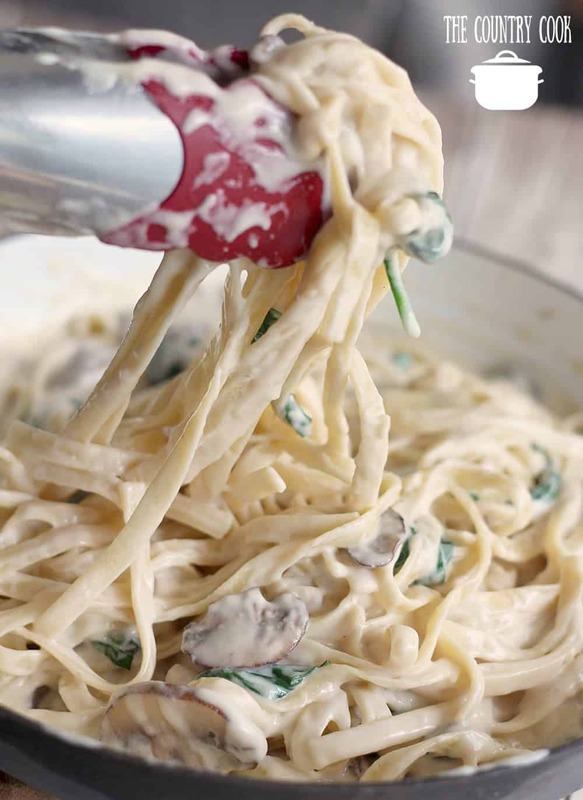 This Fettuccine with Mushroom Parmesan Cheese Sauce recipe is a serious must-try y’all – like yesterday! 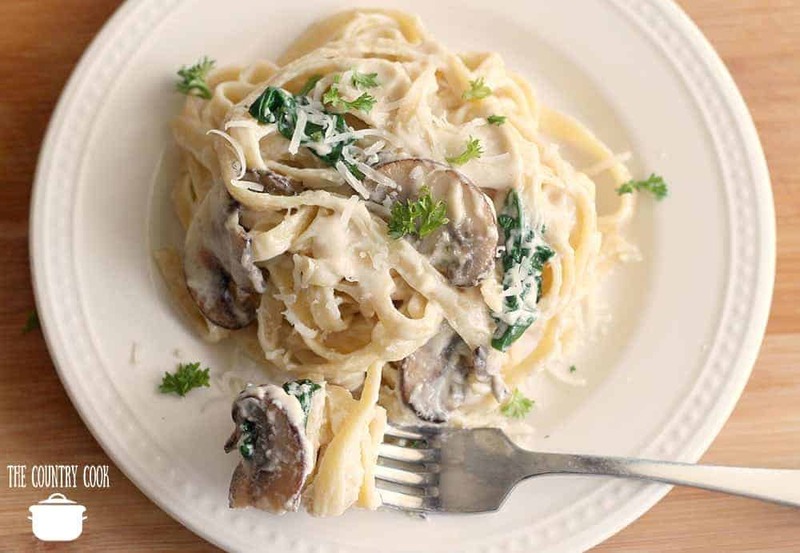 It’s so creamy and delicious and if you’re a huge mushroom fan, you’ll love this dish even more! 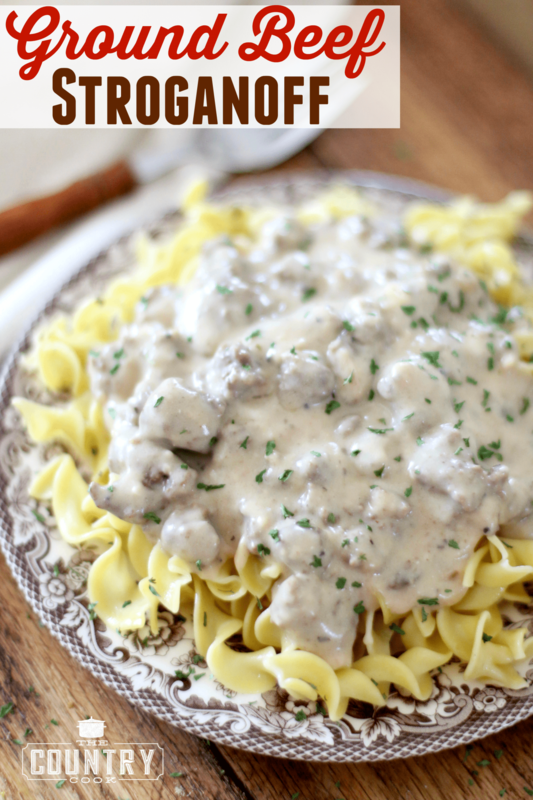 This dish really soaks in all the flavor and you are going to love this dish for dinner! 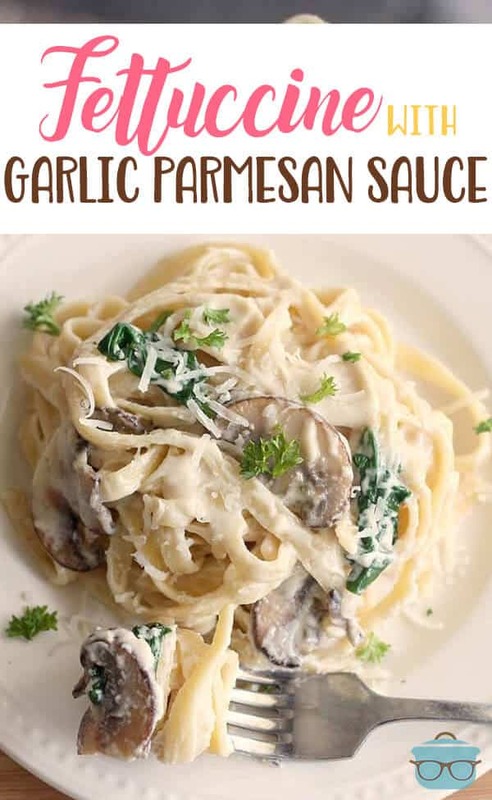 Just follow the easy step by step directions below for your fettuccine dinner recipe and get ready for your tastebuds to be in heaven. The wonderful thing about this recipe though – it works even if you’re not a mushroom fan! Don’t worry I didn’t forget about my anti-mushroom people out there 😉 I’m not a huge fan of mushrooms myself but I am trying to expand my recipes here on the blog and include a few more meatless dishes. 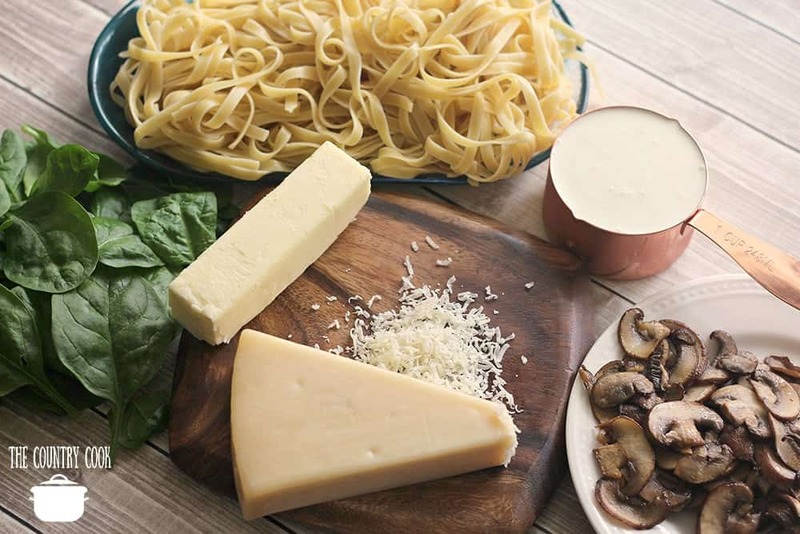 This fettuccine with mushroom parmesan cheese sauce recipe can work with grilled chicken, zucchini, squash, or sun-dried tomatoes instead of the mushrooms. It will still come out absolutely delicious, too! Before you get started, gather up all your ingredients in order to make things much easier in the kitchen! Cook the fettuccine noodles according to package directions, drain and set aside. In a large skillet, heat a tablespoon of olive oil over medium heat. 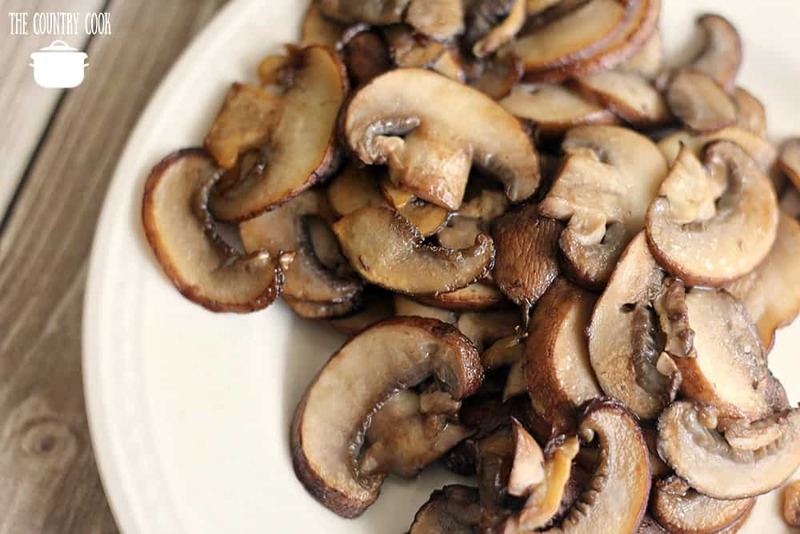 Add the sliced mushrooms to the skillet and cook for a few minutes until tender, then remove them from the skillet and set aside. You can optionally use grilled chicken, zucchini, squash, or sun-dried tomatoes in place of the mushrooms. Add the salted butter to the same skillet you cooked the mushrooms in. Cook over medium-low heat until fully melted. Whisk in the flour and cook for 1 minute (whisking continuously.) Add the chicken broth, heavy cream, parmesan cheese, and garlic powder; stir well. Increase the heat to medium and bring the sauce to a gentle simmer for 1 minute. Reduce the heat to low and season with salt and pepper, to taste. 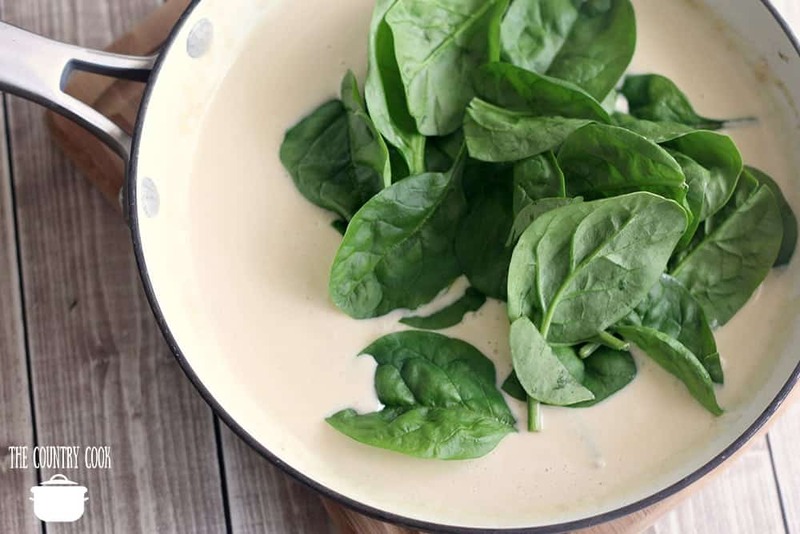 Stir in the spinach leaves and cook over low heat for 1 minute until it begins to wilt. Add the mushrooms (or your chosen substitute) and fettuccine noodles. Stir well until all of the pasta is coated with the creamy sauce. Serve immediately upon finishing. 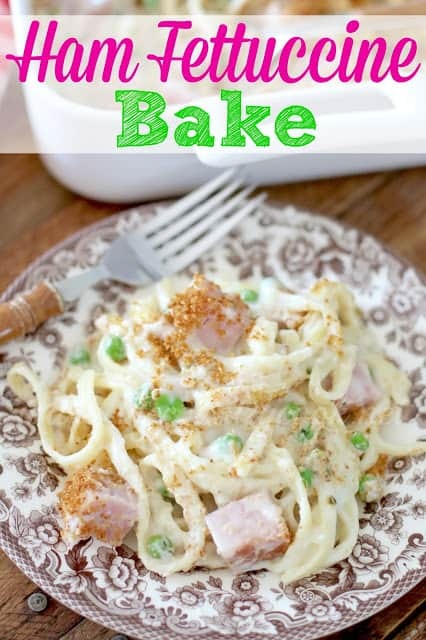 You’ll love this delicious pasta dish for dinner! 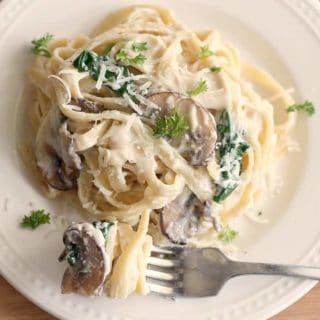 This Fettuccine with Mushroom Parmesan Cheese Sauce recipe is a delicious, creamy meatless meal. 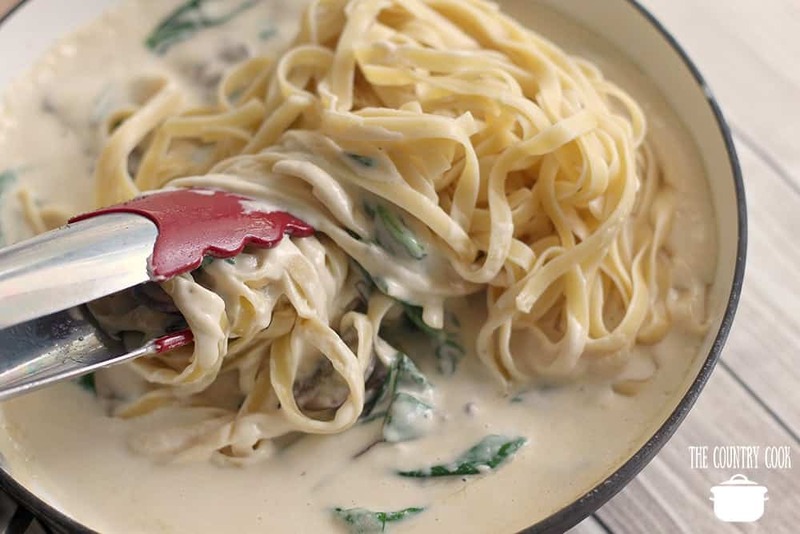 Fresh mushrooms, spinach, cream sauce and filling pasta! Cook the fettuccine noodles according to package directions, drain then set aside. In a large skillet, heat the tablespoon of olive oil over medium heat. Add the sliced mushrooms to the skillet and cook for a few minutes until tender, then remove them from the skillet and set aside. Add the chicken broth, heavy cream, parmesan cheese, and garlic powder; stir well. Increase the heat to medium and bring the sauce to a gentle simmer for 1 minute. Reduce the heat to low and season with salt and pepper - to taste. Stir in the spinach leaves and cook over low heat for 1 minute until it is starting to wilt. Serve immediately upon finishing. Enjoy! You can use grilled chicken, zucchini, squash, or sun-dried tomatoes in place of the mushrooms. Excellent – used 2% milk instead of cream as suggested, turned out real good. I could have used a few more mushrooms. Will make this again. I am a huge mushroom fan so I can’t wait to make this just as it is. Though I do have a ton of zucchini on the counter, so some of those may find themselves in there too!